Find the right tour for you through Langtang. We've got 47 tours going to Langtang, starting from just 8 days in length, and the longest tour is 19 days. The most popular month to go is May, which has the most number of tour departures. "I strongly recommend Mount Adventure Holidays. They ensured I had a safe, enjoyable..."
"I knew Shiva from Icicles Adventure in 2014 when we had done Langtang Valley Trek..."
"I spent 11 days (9 days trekking and 2 days driving) with my boyfriend and friend...."
"Experience of a lifetime! 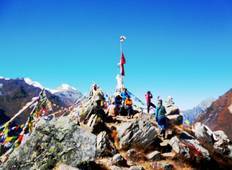 I had an amazing time on my LangTang trek and have already..."
"“We couldn't have been happier with this adventure. The views left us breathless,..."
"Second time trekking with this group. Excellent food and accommodation options. October..."
"A real dream! Beautiful weather, nice people in the group, Amazing Guide really kind,..."
Nepal Lion Tours & Treks Pvt Ltd.
"“While I found the walk challenging, I look back and are so glad I did it. 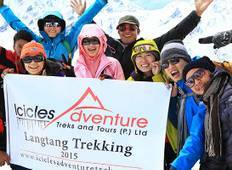 The..."
"Our Lantang trek was fantastic. The company was responsive and accommodating. Our..."